@Bon_Tempi exactly that. At the moment software seems to be the bottleneck as on paper pro 10.5 is more than twice as powerful as air 2 but in real life it probably translates to no more than 25%. This is a massive estimate though and in no way a scientific statement, just what it felt like. I have both. They are the same. Also, I have used the Pro and see negligible difference in the screen to be honest. 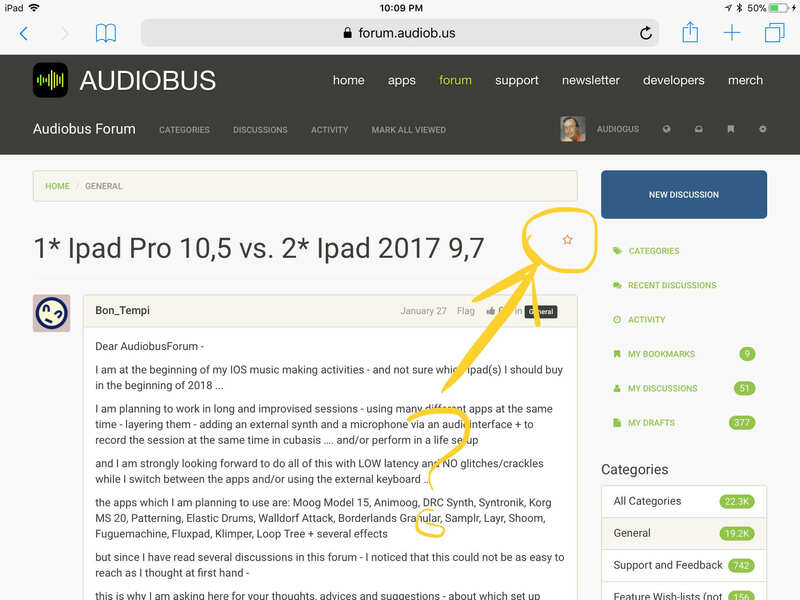 Dear AudioGus - so do you have real world experience with the 2017 9,7 - and the 10,5 Pro? I do have the 2017 9.7 but have only used the 10.5 Pro for painting in Procreate, not for music. As for just the 2017 I am very happy with it and can run many apps. If you have a specific group of apps you are curious about i could do a quick stress test for you. so you have never experienced this kind of buffer size/latency issues described by "Soundshaper" ? may I ask on which IOS you are running your Ipad - and if you experienced any problem with the IOS? Alas, I don’t have Model 15 and don’t do live performance. Perhaps because I am using this gear in different ways to Mr Soundshaper, I’ve not had his problems. I did have serious hardware issues, about three months after buying the Pro. Apple were useless. Eventually, I believe they found a way to bypass whatever was causing these problems via software, and incorporated it into IOS. I am running the latest IOS, and aside from minor issues with the App Store, and sound control not being automatically returned to the iPad after sending to external source, I have no problems with this iteration. Maybe it also has something to do with cranking the refresh rate to ridiculous levels too. Are you talking about display frane rate, right? I've limited that in settings to 60fps but it hasn't really helped. There clearly is extra processing involved with the bigger fancier screen. The bottom line for me is the actual, real world use and there it didn't quite impress me. But yah, from an Apple perspective your average user does not care about many streams of audio like we do so if a nip and tuck here and there effects the minority of niche fanastics like us then so be it in Apple buisness spreadsheet land. More than twice the power on paper boiling down to 25% seems to imply this. If Apple said you can get twice as many tracks in your fav DAW people would think Apple lost their noodles with a chorus of ‘what? Big deal’ but saying ‘display twice as awesome and you can draw on it’ at least registers as an actual thing with most people. I went from Air 1 to iPad 2017 9.7 and the screen is beautiful to me. But the best part is that the difference in CPU juice is quite noticeable especially when running Syntronik Arp sets. It really is such a great price. But then again, I’ve never seen an Air2 screen in person. I guess sometimes ignorance is bliss. and may I ask - how many and what kind of apps can you run at the same time on the 2017 Ipad 9,7 wihout getitng glitches while switching between the apps? and on which buffer size are you using it - are you on low levels (128-256) so that latency doesn´t become a problem ... ? Latency is the time between your hitting of a key/pad and the sound playing. It is particularly noticeable while playing quick notes which often (but not only) happens when playing percussive sounds (drums). When latency is too high you might encounter issues with sequencers recording notes in wrong places, even more so when quantisation is active notes might be shifted in the next available measure. When recording this might result in audio recording with a delay. Both things can be adjusted afterwards but when you're playing live it isn't always desirable. Even when just recording at home it can become tedious to have to adjust all the notes and it is better to work with lowest latency possible. 256 frames is probably the highest I'm comfortable with. Other than the lower the latency the more software instrument feels like real instrument as it responds immediately as a real instrument would. ok - thanks - got that now - but that means a buffer size of 256 would still be accetable for live recording? but 128 might be a nicer thing to have - right? but if I would go this way - I ought to find a way to keep both ipads in sync, right? best way to do so is Ableton Link? are there any alternatives? and what can I do if I want to sync an app which is not enabled for Ableton Link yet? cause as I understood it - each single app has to be abled to connect to Link right? can you describe your way of using the 10,5 Pro? how many apps at the same time? which apps? recording at the same time? and at which buffer size? I would omit Attack as a realtime instrument option but would certainly use it as a sound generator for making sample kits for Patterning. Attack does not have Link or IAA sync. So Patterning and Elastic Drums it shall be. As much as I love Borderlands as a happy accident sketcher / sampler finder etc it has a habit of making things wonky system wide and can introduce instability. I use it more or less by itself for quick 'record it to audio' and get the f#*& out scenarios. Samplr and iDensity have both been good to me with other apps etc. I don't have Tines but will pop in another comparable Klevgrand app for parity. Will use my Nord or Circuit for midi duties, should be fine. Anyway I will try and give this a whirl on Saturday or Sunday... and consider Cubasis and IAA sync... but have a feeling two AUMs recording on two separate iPads will be the winning formula, then just dropping it all in Cubasis after the fact. Who knows maybe AUM and my 2017 ipad can handle this all by itself...? the latency on the midi keyboard etc likely requires the second iPad though and for me to use two Roland Duo Captures for audio/midi interfaces. We, as in IOS studio band RTM, work with iPad Pros. We use apps such as Blocs Wave, Auria Pro (with filters and FX on most tracks), Sample Tank, BeatHawk, TwistedWave, AudioBus and AUM both with whatever apps are required for making a particular track. On individual iPads there might be one, or half a dozen apps open at a time, with additional in-app AU and/or IAA FX. Files then fly around via Dropbox. So far, we have not had any issues doing this stuff. You can hear the results via our BandCamp page, and regardless of whether it’s your kind of music, you will hopefully be able to hear that polished results are possible. Many others here can provide other examples, which may help. Among those others, of course, there will be entirely different workflows. Many will be using a lot more actual tracks than we do, and working much more in midi. Obviously, such people are infinitely better qualified to tell you what limits they have found than I. You could also look up last year’s Doug Woods benefit album, link below, featuring lots of music makers from these parts. Just find who is doing stuff in the same area you like, and ask them how they do this work. I concord with @AudioGus you're better off piping stuff to audioshare for recording. Cubasis had a large footprint and more things to go wrong. Man, you need to stop with all of this nonsense right now, and get back to focusing on BM3! Get your head back in the game, son! haha, you are right! But my heart is in this experiment as I initially got into iPads with the intention of recording long multitrack jams and editing them after in a DAW. Just curious to see how this approach holds up in this day and age. Not like I need to actually make anything that sounds good so that makes it easier. I am sure it has been recommended many times already, but consider adding AUM to your setup. You can record everything as individual tracks or sub-mixes or main mix, all at the same time right into AudioShare. It has auto loop recording ability, and built in audio file playback that syncs and is loopable. This would eliminate Cubasis if you are just trying to use it to record, thus saving you some well-needed resources. Ha ha. Yeah it does sound like a fun exercise. Probably a lot more doable with current iPad hardware, too. Have you tried doing this type of session in BM3 ever? I'd be quite interested in finding out a practical way of using 2 iPads and how they can be tempo synced. Link is great but it only bloody works via network. I seem to recall (drunk/dream/both?) that I once created a wifi hotspot on my old phone and it worked for the two ipads.. I have only ever done bits and pieces of it in BM3 as I tend to commit to audio quickly, which is the charm/value of BM3. I do think my 2017 ipad5 doing the heavy lifting with most of the sequencing and then my Air1 doing the low latency synth playing would be the ticket. Two Air2s or two 2017 ipad5s would be a pretty potent duo I am sure. In all I have an Air1, 2017 ipad and a mini2. If I have to crack em all out so be it but I like the idea of two. This guy chose to use 8x ipad 3's! One app per pad. I thought it was limber thinking. I just made a ‘personal hotspot’ on my iPhone4S and I could then connect my two iPads to it and run Link. It still required that cellular data be on the phone but it was neat to do it on the train. Wow, I had no idea that would work! Awesome, thanks for sharing that one. Buffer had to be at 512 with this much running (256 was major glitchy) and it would peak at around 80% CPU. I noticed no significant latency and the playback was super solid, no major glitches or sync errors while switching apps etc and it seemed fine for live that could also be recorded to separate tracks on the fly. Recorded for a good five minutes while jamming, no issues, aside from two very very minor audio hiccups that did not even record. Whoot! To get closer to the original goal I then set up Audiobus running in parallel to AUM for sending DRC into LoopyHD. I then sent LoopyHD to AUM. Doing this caused more audio glitches that were a bit worrisome (not good for live), but again did not show up at all in the track recordings. So really if you wanted to spread the love out across two 2017 iPads, both running AUM, I say it would clearly handle the load, and then some. One could be your 512 high buffer power lifter sequencer and the other the low buffer midi ninja. Also, in regards to buffer size, I think the faster the device the less latency impact a larger buffer size would have... wouldn’t it? I mean isn’t the buffer memory size and not time? The latency in terms of time of a 512 buffer on an iPad 3 would be greater than on an Air2 with the same 512 buffer size given that an Air2 processes memory quicker... no? Anyone else getting multiple emailed posts of this thread all week that I did not participate in? I get about a dozen or more emails about it per day now. Did you tap this star by mistake?